Is it a coincidence that February is American Heart Month and also includes Valentine's Day? We think not! Red Wine. 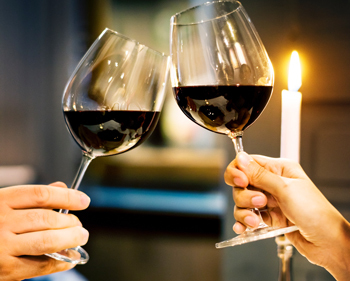 Red wine should be consumed in moderation, and although it can a better choice for those who already consume alcohol, it should not be consumed solely for heart benefits.Red wine contains resveratrol, which has been found to lower blood sugar and LDL, or “bad” cholesterol. It also is a source of catechins, which can help improve HDL, or “good” cholesterol, and polyphenols, which may prevent the formation of toxic plaque that leads to Alzheimer’s disease. Remember you should drink in moderation by consuming no more than one 5 oz. glass for women and two 5 oz. glasses for men. Dark chocolate. Not all chocolates are created equal. Flavonoids are what give chocolate their heart healthy benefits. Dark chocolate with a cocoa content of 70 percent or higher is best because it is richer in flavonoids, which help prevent the plaque buildup in the arteries. It can also boost the immune system and contains cancer-fighting enzymes. Feel free to enjoy it in moderate portions (e.g., 1 ounce) a few times per week. Other romantic gifts could include berries, apples, and tea - all foods with high levels of flavonoids! Next, if you are planning a romantic dinner, why not incorporate other heart healthy foods into your menu? Nuts. The heart-health benefits of nuts have been documented in several large studies, including the Nurses’ Health Study and the Iowa Women’s Health Study. The FDA reports that eating a diet that includes 1 oz. of nuts daily can reduce your risk of heart disease. Oatmeal. Cooked for a breakfast porridge or used in breads or desserts, oatmeal is a good source of soluble fiber, niacin, folate and potassium. Oatmeal cookies with dark chocolate chips might be something to consider for a Valentine's Day treat! Flaxseed. Choose either brown or golden yellow and have it ground for a good source of omega-3 fatty acids, fiber, and antioxidants. Consider adding flax meal to muffin recipes to add some heart health benefits. Fish. The best fish choices are those that are high in omega-3 fatty acids, which reduce your risk of a heart attack. Salmon and tuna are excellent sources. Canned salmon also contains soft bones, which gives it an added boost of calcium intake.